Digital content has been a driving force in optimizing sales since its fruition. However, many businesses are still in the dark as to how or why they would need a product such as a 360 virtual tour. For those who know of this valuable tool — popularly utilized by multifamily and senior living companies — but do not know how to inquire about it, here are some helpful questions and answers to consider before locking down any deals. 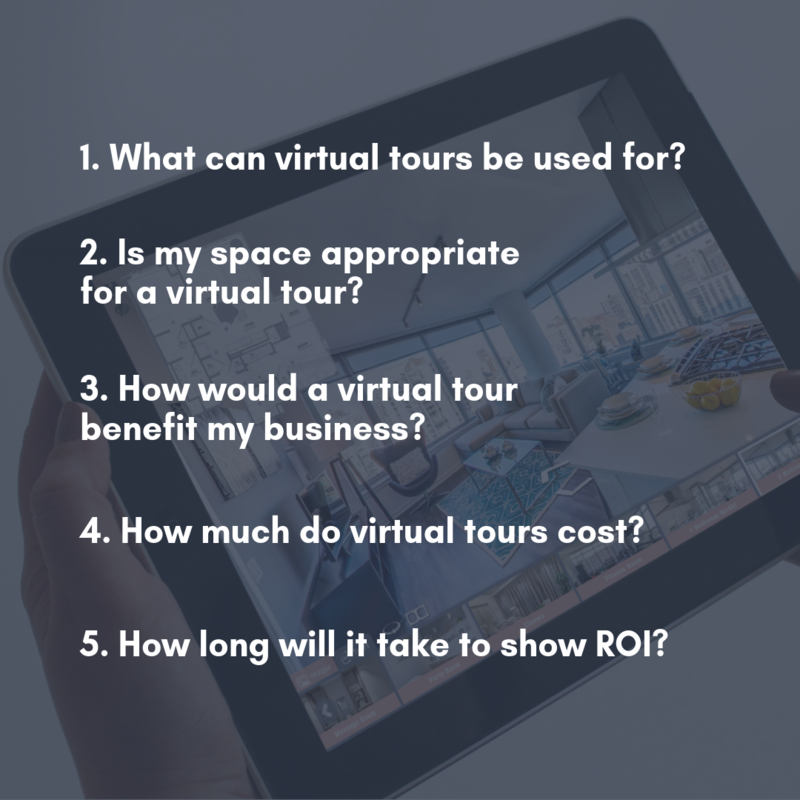 Fortunately, we have the answers to each of these questions to get you started in your hunt for the right virtual tour company. 1. What can virtual tours be used for? A somewhat obvious, but necessary question. A digital content specialist can provide more specific details about their function in regards to unique developments, but it all boils down to your overall goal. Virtual tours give potential prospects the opportunity to walk through a 3D replica of a space from the comfort of their home. This is beneficial to a multitude of businesses, such as hospitality, event centers, and even sports arenas, by cutting out the middleman and allowing customers to be their own tour guide. 2. Is my space appropriate for a virtual tour? Many businesses question if the space they are considering is “too small,” or, “not complex enough.” This is one of the most important questions to ask when considering budgets. Although all properties could benefit from virtual tours, businesses with a low marketing budget may not be up to par with this particular investment. Potential customers should still speak with a digital content advisor or marketing manager to discuss marketing tools that would best suit their company. 3. How would a virtual tour benefit my business? How many people have gone, let’s say, apartment shopping and almost immediately after a viewing forgot what the space looked like? Unless you have a photographic memory, this has probably happened to you. Studies show that 50% of people are not able to physically visit a property. With time and location restraints, virtual tours have that ideal convenience factor that allows potential customers to look online before physically visiting a property. Studies show that 50% of people are not able to physically visit a property. In addition, it utilizes engagement with customers in a way that creates trust and loyalty by providing honest and helpful features. 4. Are virtual tours costly? At face value, virtual tour content may seem like an expensive option compared to, let’s say, photography. Different businesses contain different price ranges that can be provided by a digital content specialist. An important thing to remember is that yes, while costs upfront may seem expensive, the logic behind leveraging this marketing tool is that it has the potential to weed out any uninterested customers, which in the end saves time and money. 5. How long will it take to show ROI? All businesses have a game plan that includes an ideal future outcome. Time can certainly be the make-or-break factor that determines turnout. There’s no easy way to put an exact number to it, but according to research from TIG Global and Omni Hotels, VT increase bookings and look-to-book conversion rates by as much as 16% to 67%. If we compare that to traditional content marketing initiatives, those numbers blow basic content strategies out of the water. The best answer to this question, however, would be to plan accordingly as you would with any digital content approach, anticipate the development process and stay in touch with customer interaction. There’s a reason digital content is the main focus of business marketing around the world. It’s proven to be engaging, convenient, profitable, and most of all effective. Help your business stand out among the rest, and give customers the tool they’ve been waiting for. If you have any other questions that need to be answered, contact us today.